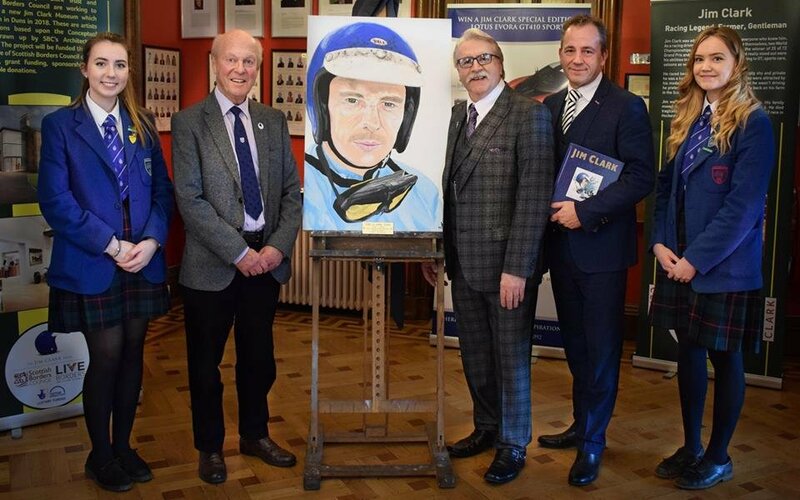 New Jim Clark Painting unveiled!!!! Very proud to have my Canvas painting of Jim Clark unveiled this afternoon by Jim's Cousin Doug Niven. It will permanently hang in Clifton Hall School nr Edinburgh, where Jim Schooled. Great day and Doug loved the image. Doug also brought along one of Jims Original race suits and unbeknown to me, its the same suit I had painted in the canvas, amazing!!! Doug giving the thumbs up to my Canvas of his Cousin Jim Clark. Here's another great pic from the day, Doug, me and the headmaster . You should be selling prints of that. Thanks for your comment Phil! I'm doing another Canvas of Jim which is being donated the The Jim Clark Museum later this year. They have the option to sell prints of that with my blessing, with all the sales going back into the museum. I may just do some more paintings of Jim in the future, where I could sell prints.